A visit to Australia must include a visit to the Outback. 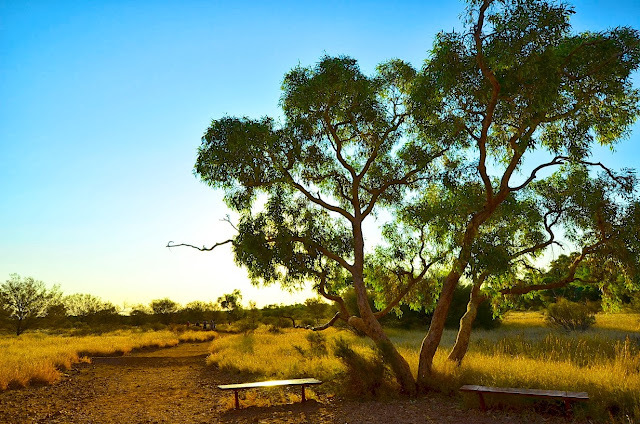 Of course, when we spoke of going to the Outback, locals chuckled at us and asked exactly WHERE in the Outback since the Outback refers to any area outside of urban areas. 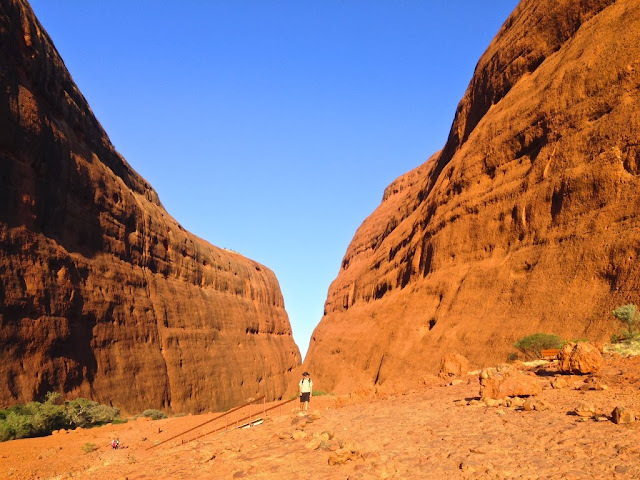 Specifically, we were headed to the barren Northern Territory of Alice Springs where we rented a car and drove for 6 hours to Ayers Rock to view the local Aborigines' sacred rock, Uluru, and the Olgas, two major sandstone rock formations rising above the landscape. When we rented our car, we took out extra insurance. Apparently, many kangaroos are hit along the stretch of highway to Ayers Rock and can cause much damage to a car. 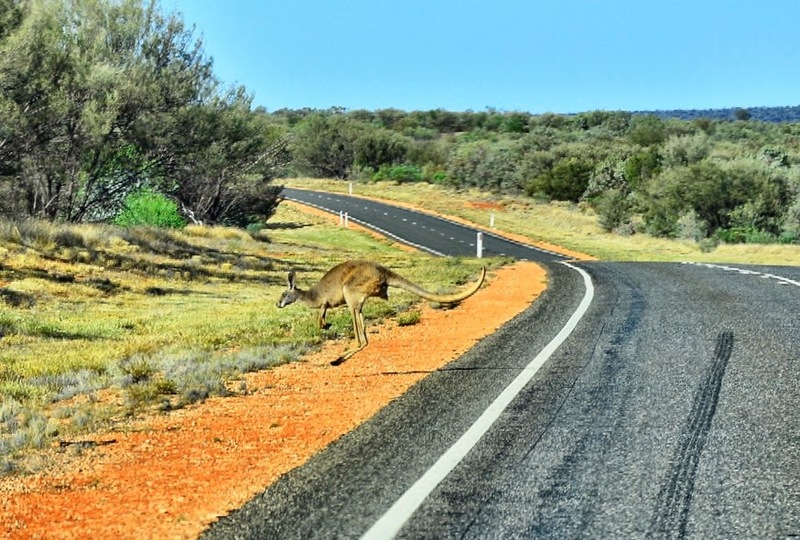 So when the below 'roo' bounded across the highway in front of us, we became even more cautious during our drive. It must have been a common crossing for the 'roos' based on the tire tread marks on the highway at that point. 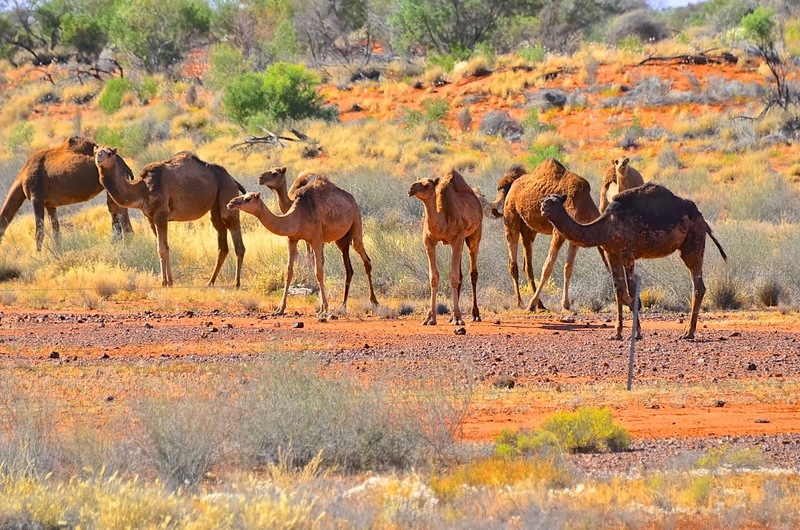 Another fascinating fact was that Australia is the only country where there are feral herds of camels! 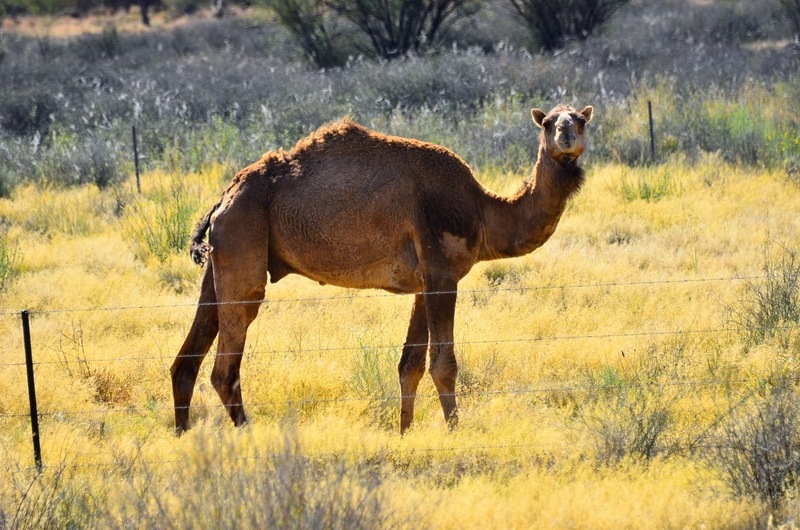 I never associated camels with Australia but apparently they were brought over back in the late 1800's for transport across Australia and now total more than a million. Needless, to say, it was fascinating to see them grazing along the highway during our drive. They too were a bit curious of us as we stopped to capture their image, but soon went back to grazing. 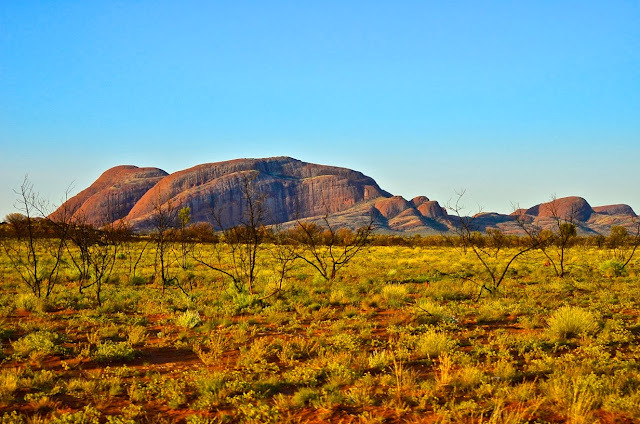 Below are some images from the area that include Mount Connor, Uluru and the Olgas. Of course, I had to include a bird. 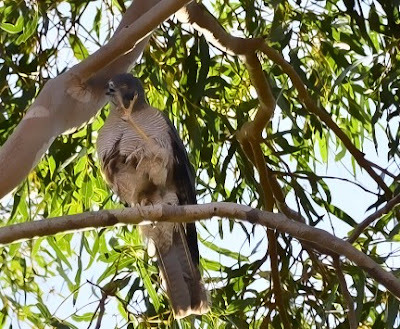 I miss my backyard birdies! Hope you enjoyed. Coming up ... Port Douglas and the Great Barrier Reef. My visit to Australia did not include the big red rock...but you have completed that for me...thanks! What a wonderful adventure you must be having!!! Thank you so much for sharing your travels with us. 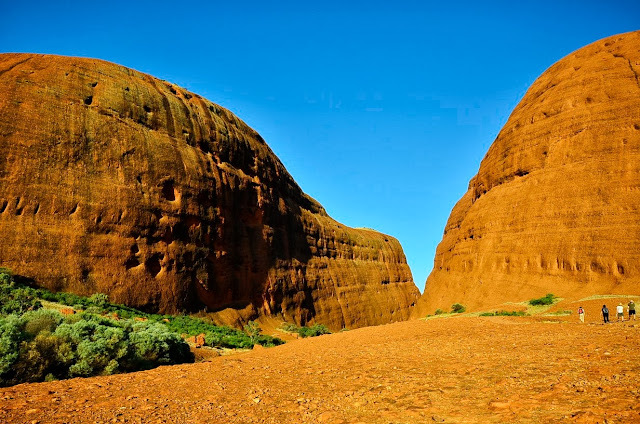 So much colorful beauty and, of course, I love the kangaroos and camels!! Not our normal neighborhood critters!! Have a great weekend, Reena!! Thanks for sharing the fun and the beauty!! Wonderful images of something I've always wanted to see in person. I knew of the camels wandering the outback but had no idea their population is so great. these photos are just gorgeous !!! It's great to follow your tour around Australia and New Zealand. You're making us visit those far away countries (for many people). Thanks and take care in the outback. Wonderful adventure. I love seeing the animals. The land down under certainly has a very unique landscape and inhabitants. Isn't it amazing this country? I was blown away by all the different animals and landscapes. Those red rocks are so special. It is such a fascinating country. wow. what i always wanted to do...go to australia! what cool rock formations and animals...what a treat!!! What a cool trip! I would love to see these critters. Especially the roos! Happy weekend and safe travels. What a wonderful place to be! Imagine seeing herds of wild camels - oh, wow! Beautiful, beautiful scenery. How cool to get to see the different wild life. Loving the shots of the camels. Thanks so much for sharing your adventure with us. 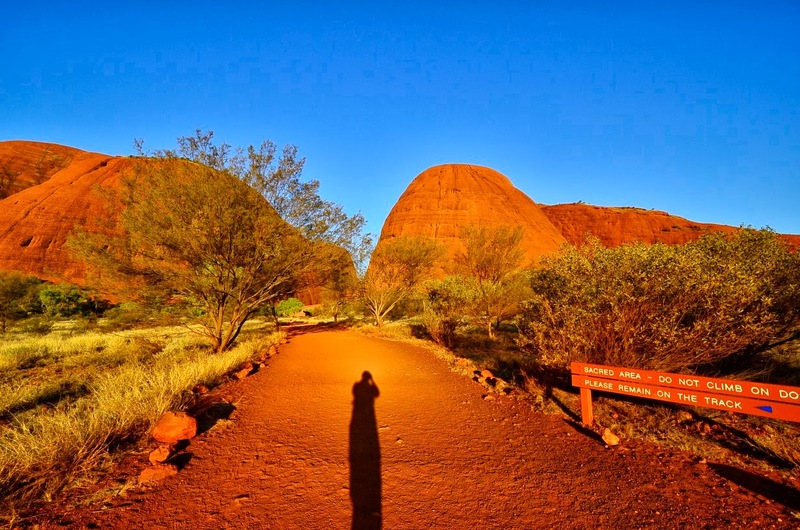 Wonderful images of Uluru Reena :) Still looking forward to the Perth shots. Fabulous shots - I especially like the shots of Uluru. I never would have associated camels with Australia. Thanks for the fascinating photos. WOW, those shots are spectacular... the colors really pop! 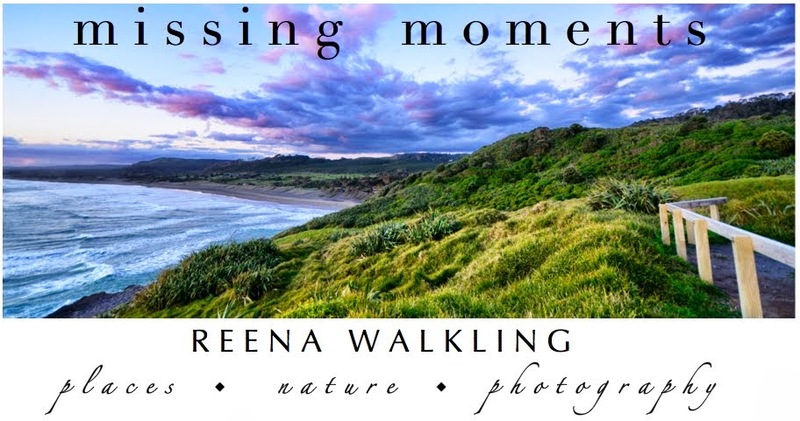 These are glorious shots, Reena! Thank you for sharing your trip. When I get time, I'm going to sit back and revisit all of your posts! Wow Reena. 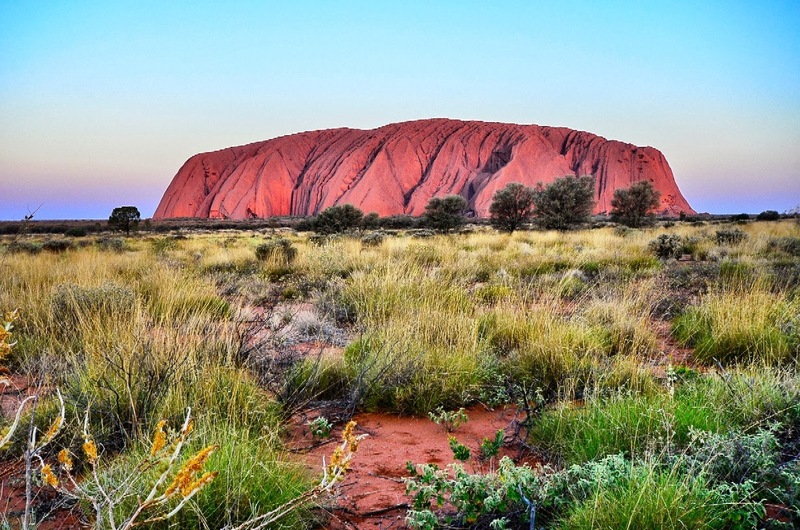 You having truly captured the colours of Uluru. Can't wait it see the ones of Perth. What a great adventure! As always, your photos are amazing!